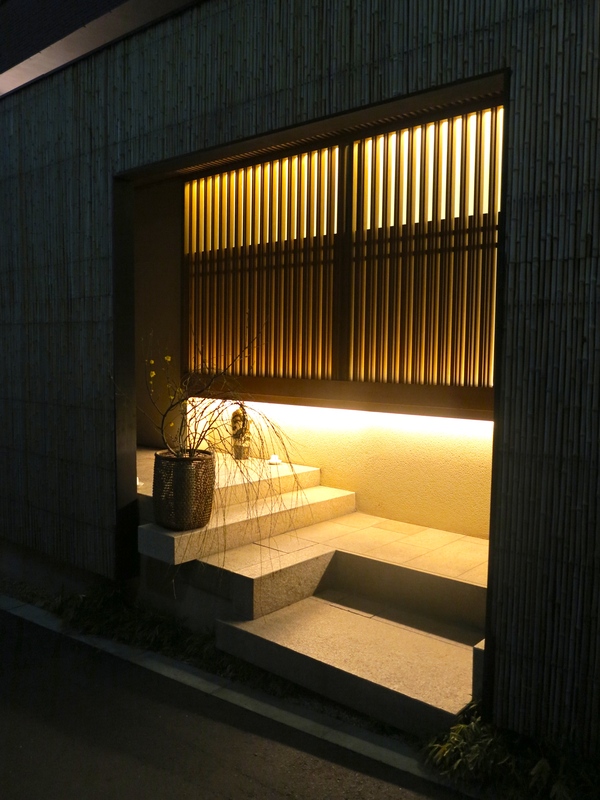 Decided to give this fusion kaiseki restaurant a try tonight because all the other diners I wanted to visit were either closed or fully booked. Well before I start making this place sound like a sad rebound that’s available when everyone else isn’t, Kohaku is actually a highly acclaimed restaurant boasting 2 michelin stars. The only reason I was able to get a reservation last minute was that, unlike at most high-end kaiseki restaurants in Tokyo, chef Koji Koizumi and his team (as I later observed) are energetic night owls who can work well past midnight, meaning that multiple rounds of customers get the opportunity to enjoy full course dinners everyday. 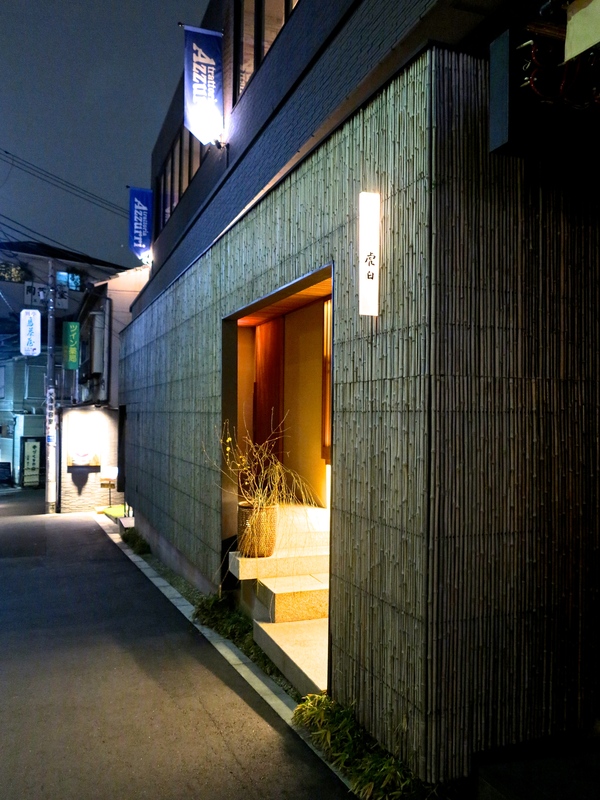 Chef Koizumi previously served at the famous 3-Michelin-star Ishikawa, a traditional kaiseki ryotei that in fact used to be located exactly where Kohaku is right now. 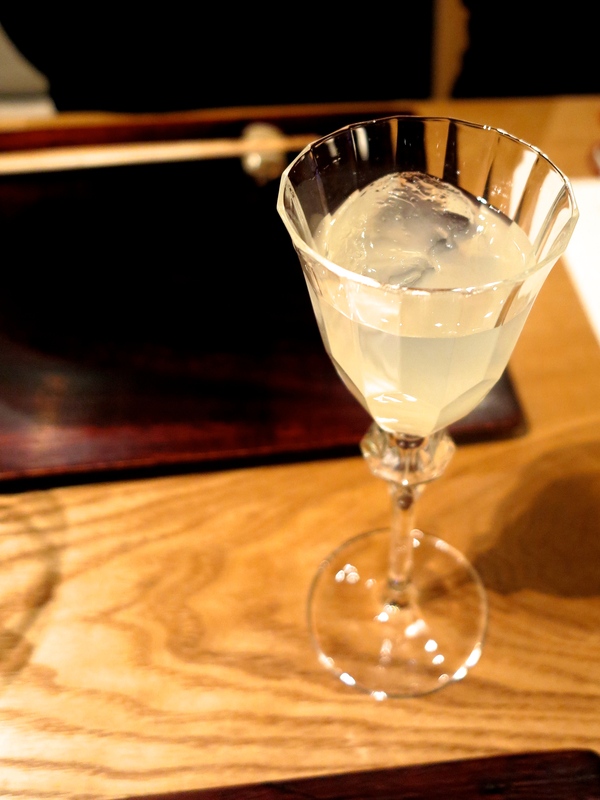 After the old Ishikawa was re-positioned, Koizumi took over the space (though chef Hideki Ishikawa remains one of its owners) to begin a new project that took traditional kaiseki to a modern plane, by incorporating ingredients from other culinary capitals such as China and France. 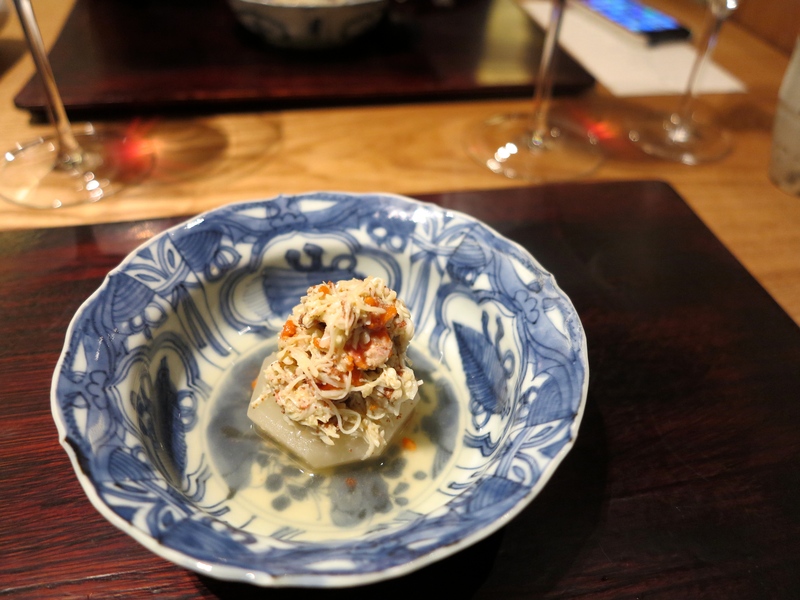 The meal began with a delightful sakizuke (the Japanese equivalent of the French amuse-bouche) of ebi-imo, a traditional Kyoto vegetable that literally translates to “shrimp potato” due to the shrimp-like stripey pattern on its skin. 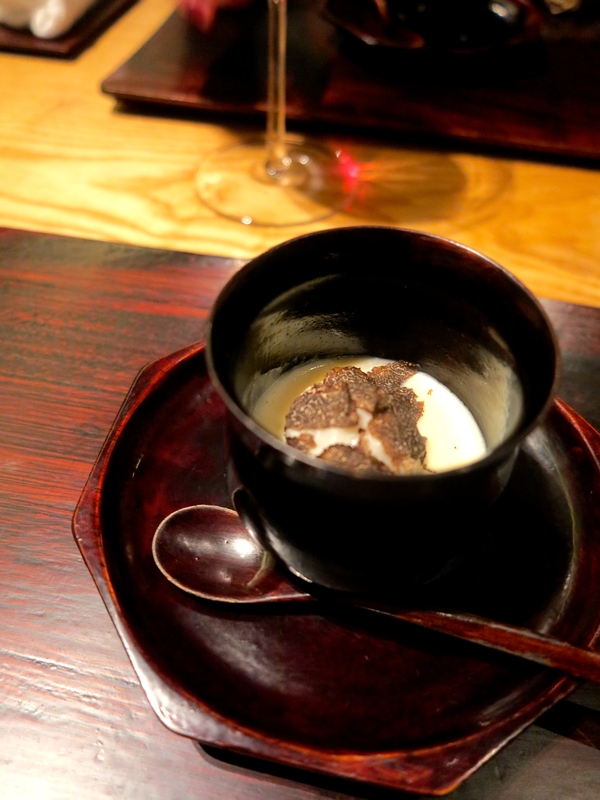 Perfumed with a few slices of black truffle, this appetizer set the scene for an avant-garde kaiseki dinner with a French twist. 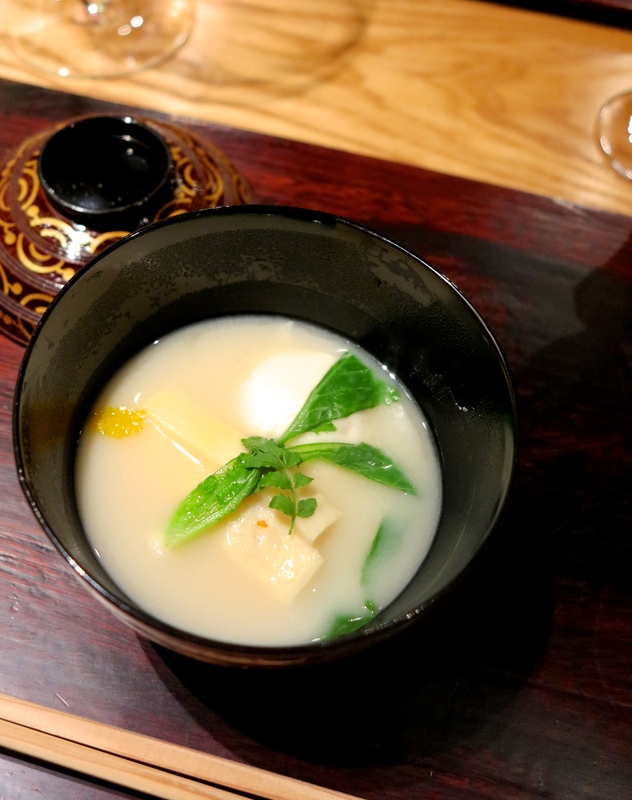 My first course (ippin) was fugu (blowfish/pufferfish), and its shirako (or milt, or sperm, whatever you like to call it) soaked in mizore-zu, a combo of grated daikon radish, rice vinegar flavored with mirin and citrusy yuzu peel. Plump and velvety, my little sacs of fugu shirako matched exceptionally well with the bright tangy flavours of the mizore-zu. 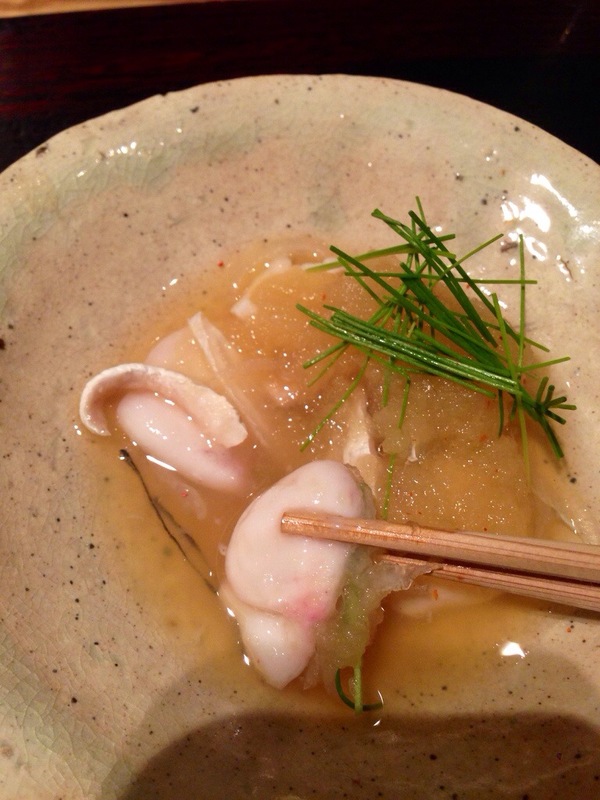 Fugu was skillfully prepared into paper-thin slices, with small slivers of its gelatinous skin adding delightful, crunchy bites to the otherwise moist, creamy dish. 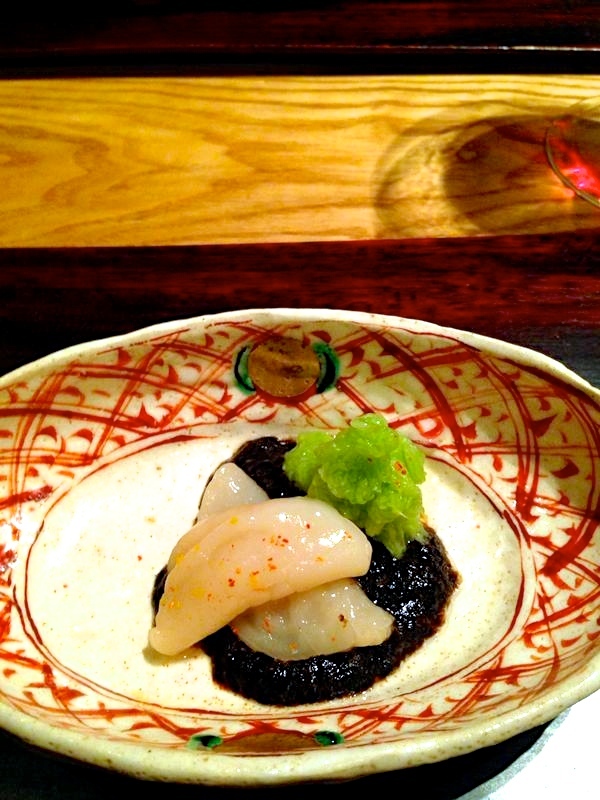 Those not keen on blowfish sperm were served this hotate (scallop) with konbu paste for substitute. 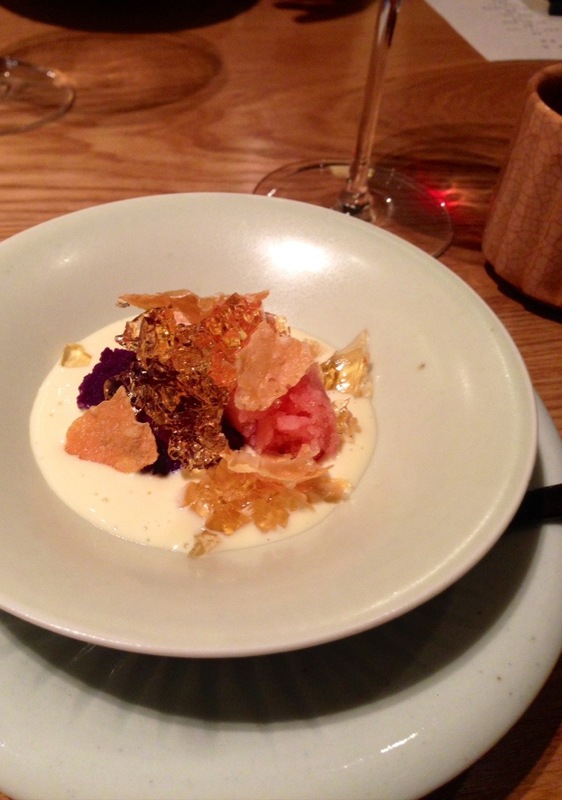 I had the pleasure of trying this dish as well because I was hungry … since it was already quarter past 10 at this point! Less exciting, but very fresh nonetheless. 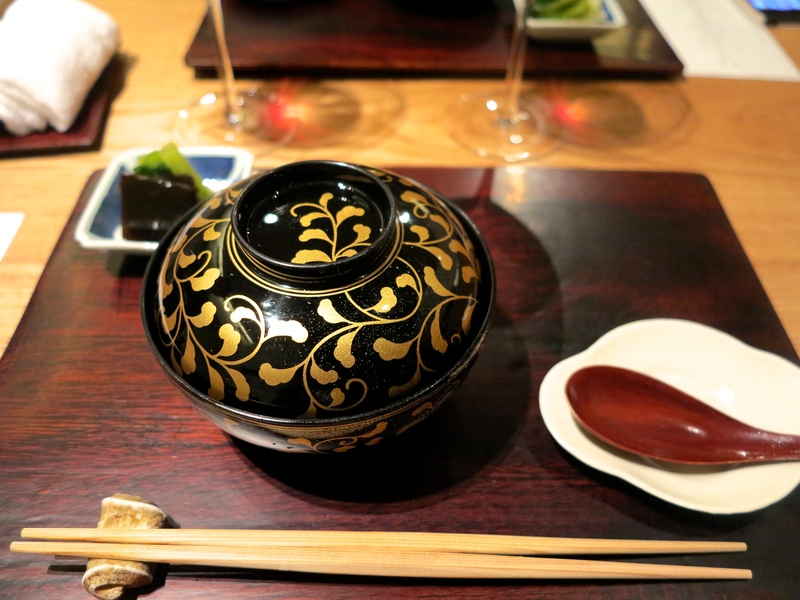 Next up was the shinogi しのぎ course, a segment of kaiseki cuisine where something relatively substantial, such as rice or soba, is typically served. 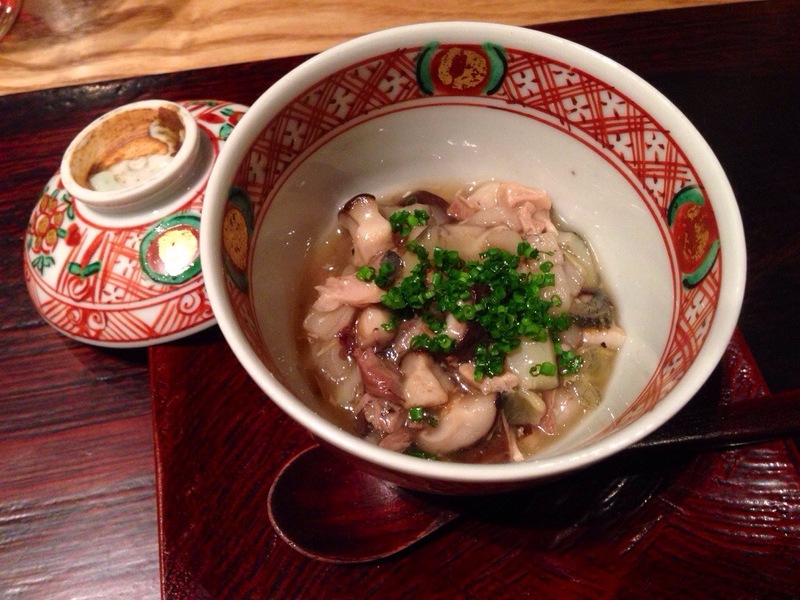 Tonight I had this suppon gohanmushi, (snapping soft-shell turtle steamed rice). Super rich in collagen, chef Koizumi prevented the gooey consistency of this gohanmushi from becoming too thick by balancing it out with tiny, crispy cubes of wintermelon and shiitake mushrooms. The sophisticated, intense flavour of turtle meat (and its nutritious amino acids!) is infused into every spoonful of perfectly firm rice. Not that I ever care about health when it comes to good food, but if something tastes this good and has notable beauty benefits, I’m all in! 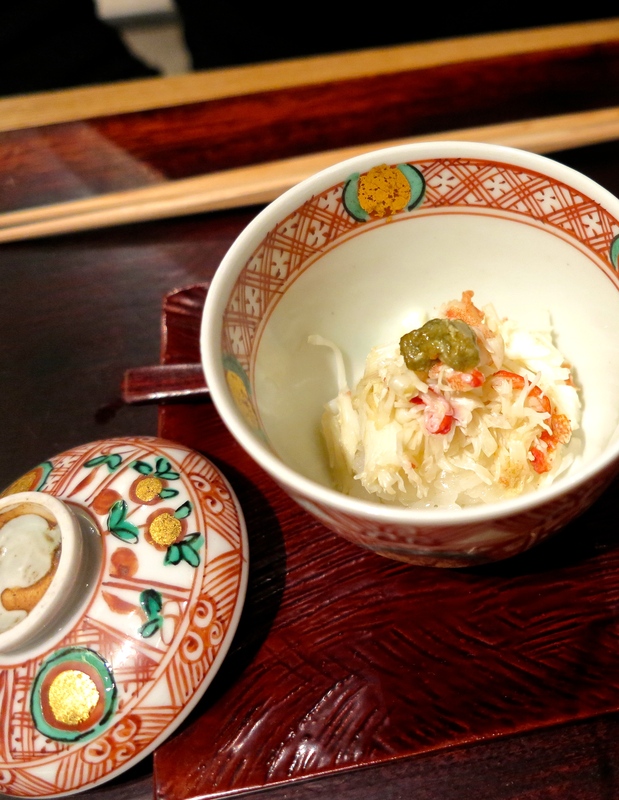 I also tried a bit of the koubakogani (snow crab) gohanmushi. This was fantastic in its simplicity, for the flavour of fresh crab is best preserved without tampering too much with its natural sweetness. 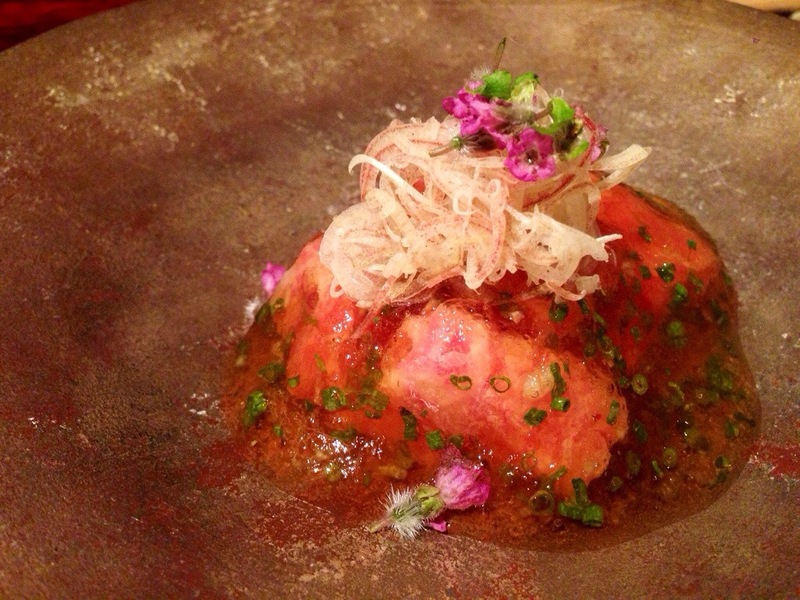 A tiny dab of kani miso (crab roe) rests on top, adding a trace of creamy, pure umami. In the middle of the meal I ordered a glass of “la france” sake. For those who are unfamiliar, la france is a European pear originally cultivated by a French man called Claude Blanchet back in 1864, and then introduced to Japan during the Meiji period. I guess they were not bothered with giving the pear from France a name any more original than La France. Its texture is reminiscent of a hybrid between apple and peach (very juicy, like the japanesemomo) and is extraordinarily sweet compared to most other pears. I was very happy with this glass of sake because it showcased the unique, nectarous sweetness of la france most faithfully and whilst it was extremely easy on the palate, it did not feel like it was lacking in alcohol content (hate drinks that are literally just juice when they are not supposed to be juice!). 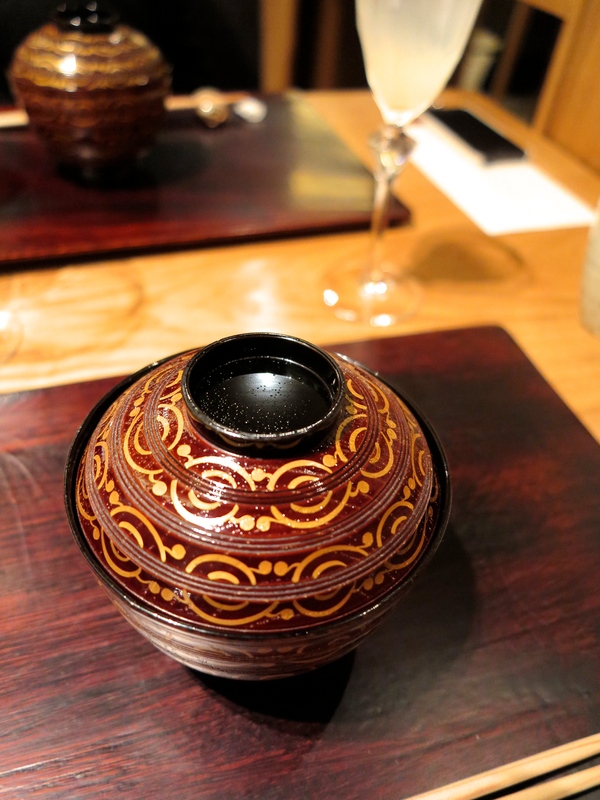 Next I was presented with this beautiful bowl ; here is the Owan course, a warm soupy dish that is served during the course of a kaiseki meal. For tonight’s owan I had fresh bamboo shoots and white sesame tofu in a gentle white miso soup base. The flavours of this dish were delicate and if you are the kind of person who only enjoys heavily seasoned food or deep fried chunks of meat then you are not going to like it. Well thankfully I’m not one of you :p. The fragrant taste of sesame spread through my mouth subtly but clearly, and together with the freshly picked bamboo shoots, this was all in all another enjoyable dish. The wagyu beef sashimi! This was simply divine. I often found beautifully marbled pieces of wagyu beef too oily or fatty for my liking but here, combined with the zesty ponzu gelee, it was a match made in heaven! NO SHI*T THIS WAS GOOD. Melt-in-mouth tenderness that literally evaporated as soon as it hit my tongue, leaving only the transcendental, buttery taste of beef behind. 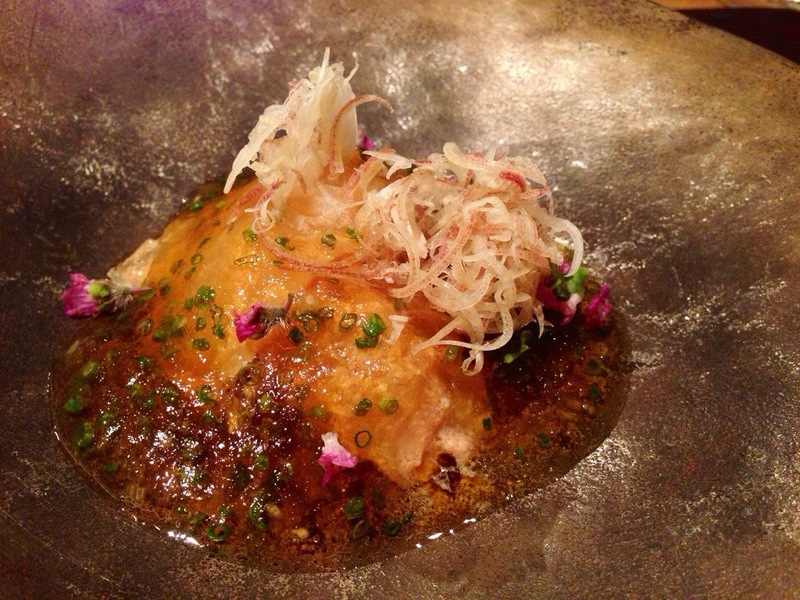 Next up was the yakimono, or flame-broiled dish. This was a super succulent fillet of nodoguro (blackthroat seaperch). I loved the lingering aroma of the miso marinade which at the same time did not overshadow the inherent flavours of the fish. 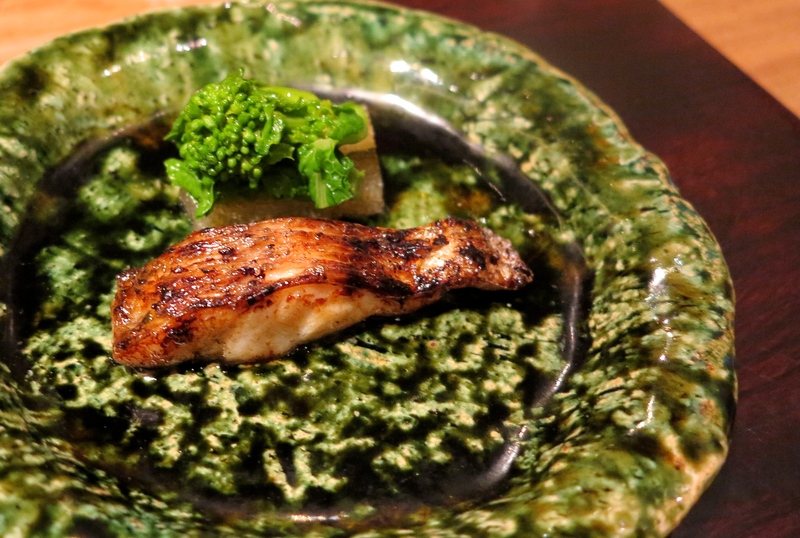 This was served with komochi kombu (herring roe on kelp) and nanohana karashi ae (brocollini/steamed rapeseed flowers with a soysauce/dashi/mustard marinade), both zippy compliments that worked well to counterbalance the greasiness of this fatty nodoguro. In addition I tried the flame-broiled kuruma-ebi (Japanese imperial prawn/tiger prawn) which smelled incredible and after devouring both immaculate plates of seafood I had the sudden urge to become a fisherwoman who lives by the sea and eats from the ocean everyday. I was served my hiyashimono (the cold dish) just in time to cool those impractical, nonsensical thoughts down (I hold utmost respect for all fisher-men and women; I simply don’t think I can handle that life). 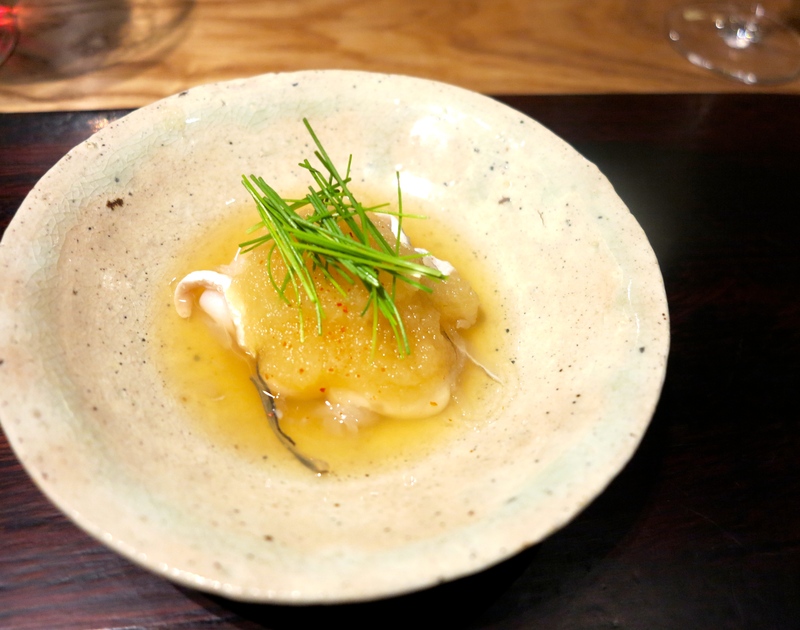 This was the matsuba crab and kabu (turnip). Again not a dish for those with less sensitive palates but I inhaled this one in seconds because it was so refreshing, almost like a kuchinaoshi (palate cleanser) after the two relatively salty yakimono dishes! After the cold dish it was time to warm up again with the nimono , or simmered dish. 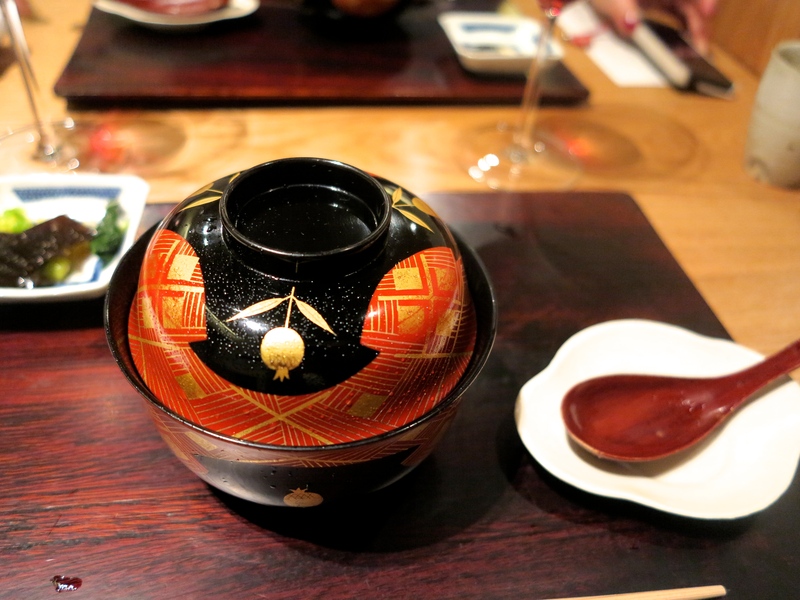 This was the Zao duck simmered with horigawa gobou (burdock), shungiku (edible chrysanthemum greens) and daikon (radish). The duck was pleasantly gamey and juicy, and at this point two slices was exactly the right portion I wanted to be served. I did not want to be too full before the next course which I specifically ordered upon making my reservation! And what could be in here? 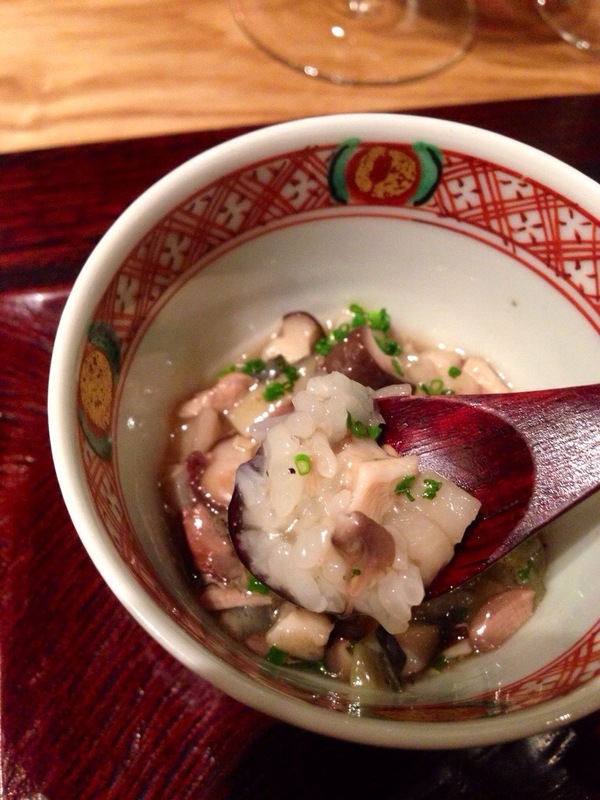 This was the oshokuji (rice dish made with seasonal ingredients) I had been waiting for. Dun dun DUNNN!!! 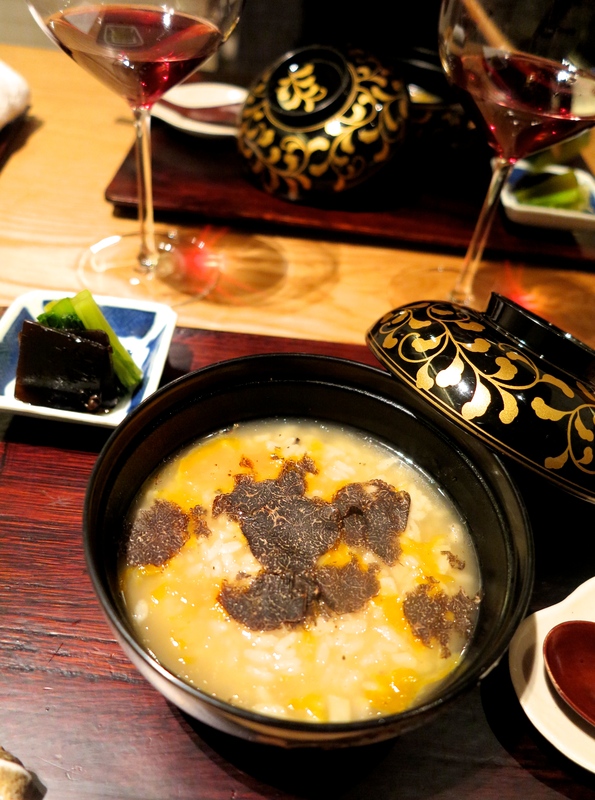 This was my black truffle zousui (japanese soup rice … or hangover porridge) made with aromatic black truffles, a little bit of egg, and crunchy little dices of lotus root producing a zousui with titillating textures. Strong whiffs of truffle wafts through every single spoonful of this delectable bowl of SOUL-HEALING MAGICAL OMNIPOTENT HOLY SPIRITUAL GODLY ELIXIR OF LIFE!! (ok I’m writing this at 2am so I’m kinda **** in the head at the moment). Absolute ambrosia!!! OF COURSE I ASKED FOR SECONDS. Served in a bowl with a different design (I always pay attention to tableware and cutlery used … somehow that is a very enjoyable thing for me). uhuhu! P.S. the homemade tsukemono (japanese pickles in small dish on the left) were very, very good too. Last but not least I had the dessert, consisting of strawberry sherbet, murasaki-imo (purple potatoes), rum jelly and deep-fried yuba (tofu skin). This might look a bit messy here but tastewise it turned out to be a well-coordinated, interesting but harmonious dessert that ended the meal on a high note. Had to take a photo of this very cool portrait of a white tiger before leaving. 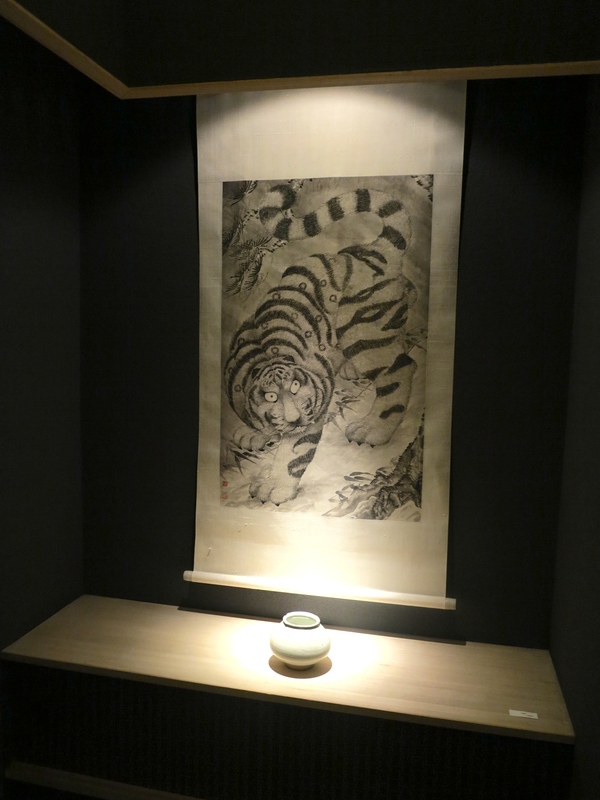 (btw the restaurant name Kohaku literally translates to tiger white). Had a casual chat with chef Koizumi as he sent us out of the restaurant and then realised it was almost 1 am already. Oops! I shall be back!